Flautas are a staple of comida corrida (i.e. daily cooking) over in Mexico. And it really is no wonder, as they’re totally addictive. 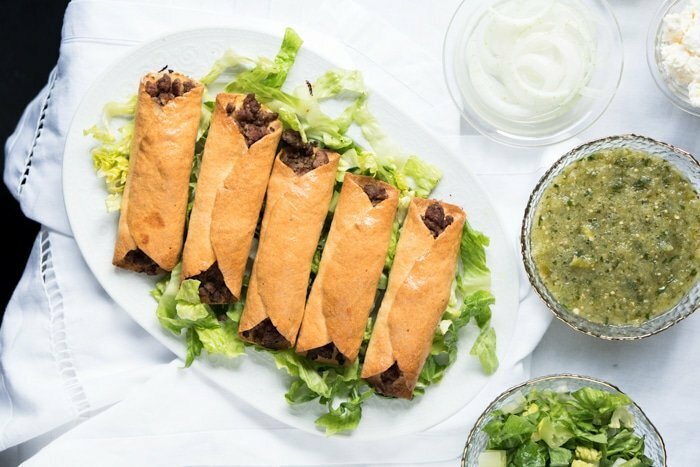 And so, these gluten free and keto Mexican flautas are the answer to your taco dorado cravings. Traditionally, white corn tortillas are tightly wrapped around shredded chicken, beef (either ground or shredded), or mashed potatoes. Followed by a brief shallow-frying until golden ‘n crispy. To make them keto we took a different route with our grain-free tortilla dough. And given that corn’s out of the question, the results are slightly different taste-wise. But totally delicious, promise. 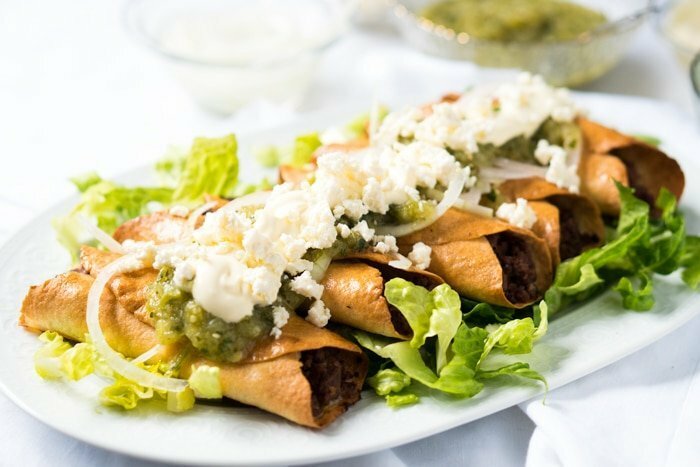 We found that the best route to take for these keto Mexican flautas is to wrap them up with the uncooked tortillas, brush them with olive oil and bake them until nice and golden. You save a bunch of steps here. Otherwise you can cook the tortillas, add the filling, do a light fry, and then pop them in the oven to crisp up. But we found that they brown way too much in the process. 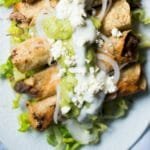 You can make flautas traditionally with pretty much any shredded chicken, beef (shredded or ground), or mashed potatoes (unfortunately not keto). 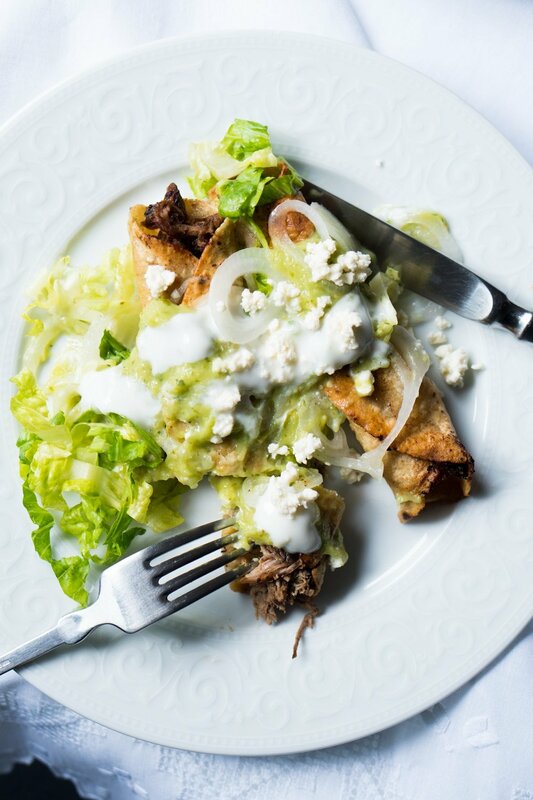 And we absolutely looove to make them with our slow-cooker pulled skirt steak. Crazy tender and insanely tasty, it really is an unbeatable combo. Ah, and make sure you don’t forget the avocado salsa verde. A taco specialty. Flautas are a staple of comida corrida (i.e. daily cooking) over in Mexico. And it really is no wonder, as they're totally addictive. 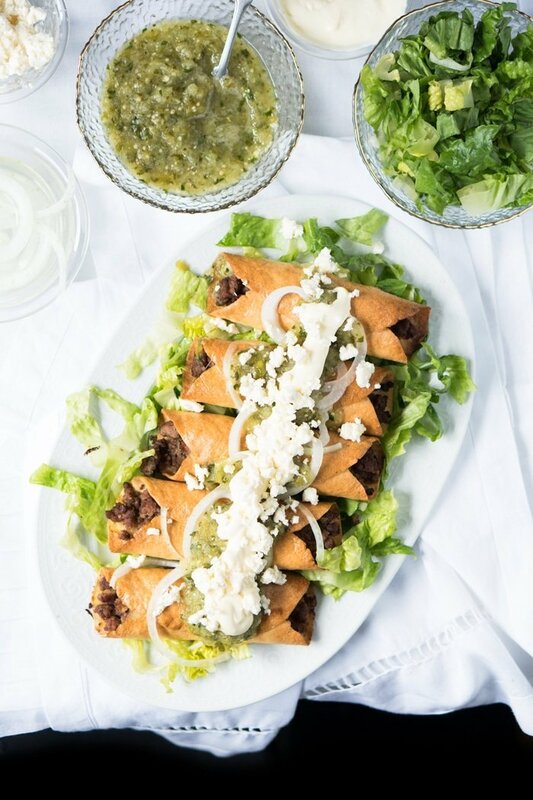 And so, these gluten free and keto Mexican flautas are the answer to your taco dorado cravings. Break the dough into eight 1” balls (26g a piece). Roll out between two sheets of parchment paper with a rolling pin or using a tortilla press until 5-inches in diameter (much easier). If fuzzy about presentation, trim edges if needed. Use the dough ASAP, so it remains sticky and you can close the pockets easily (it dries out after 10-15 minutes at room temp and you would have to re-roll it). Assemble tacos by placing about 3-4 tablespoons of filling of choice at the center of each tortilla, and wrap the edges tightly around it. The raw dough will be sticky, so it should hold it's shape without trouble. Place flautas in prepared tray, brush with olive oil and bake for 20-25 minutes, or until golden all over. Please note that nutrition facts below are estimated for the dough only. Having said that, net carbs should still be 2g net per keto flauta if using beef or chicken. Plus toppings of choice, of course. 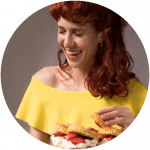 Hi Paola, what about pan frying in butter? Will they still crisp up? Can you deep fry these? Hi Durell! Yes and no. The issue with deep frying these is that they don’t come out completely crisp (but they taste delicious!). xo! Do you think it would be possible to prep these earlier in the day and then pop them in the oven straight from the fridge? Thanks! Hi Kelly! Yup that’s totally doable. Just make sure your meat isn’t wet though, or the dough might get a little wet! Xo! What about freezing these? 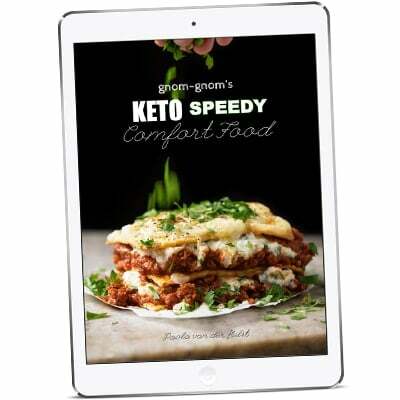 Sorry I’m working through your entree recipes seeing what is freezable for some convenient keto meals! I was thinking of freezing them raw! No worries Devyn! I haven’t tried with these specifically, but I don’t see why it wouldn’t work. The ravioli and dumplings are essentially the same dough (different cooking method) and freeze great! xo!